There's no turning back now! We're in it too deep. Star Wars: The Force Awakens is coming in less than four months, and as we get closer to the December release date, we're going to be exposed to more and more information about the story, which has been kept a secret so long, it doesn't make sense to spoil it this close to landing. But this weekend kicked off with Force Friday, which saw a tsunami of Star Wars: The Force Awakens toys and merchandise into stores nationwide. And with that, came even more reveals. Today, new clues about the true identity of Rey and Finn have been unveiled by the very detailed descriptions that come with two Halloween costumes, hinting at something huge. We also get more info on General Hux's Starkiller base, along with a whole slew of new character names and descriptions. Halloween is coming before anyone has had a chance to see Star Wars: The Force Awakens. That won't stop kids and adults alike from dressing like their new favorite heroes and villains. This is being made a lot simpler through the release of officially licensed Halloween costumes for both John Boyega's Finn and Daisy Ridley's Rey. While we still don't know their last names, we do get a better sense of who they are. And the character bios on these costumes tease one huge aspect of the story that has been awash in rumor over the past two years. First up is Finn. We already know he's an AWOL Stormtrooper. But what more rests behind those soulful brown eyes? "Sometimes, heroes come from the unlikeliest of places. The Galactic Empire has been dead for decades, but evil never really dies. With villains rising to take the Empire's place, heroes must rise to oppose them. After becoming stranded by himself in the deserts of Jakku, and meeting up with a girl named Rey, a Stormtrooper named Finn has joined the side of the Resistance. He began his adventure as a part of the New Order, but now he's one of the few people that can stop them. 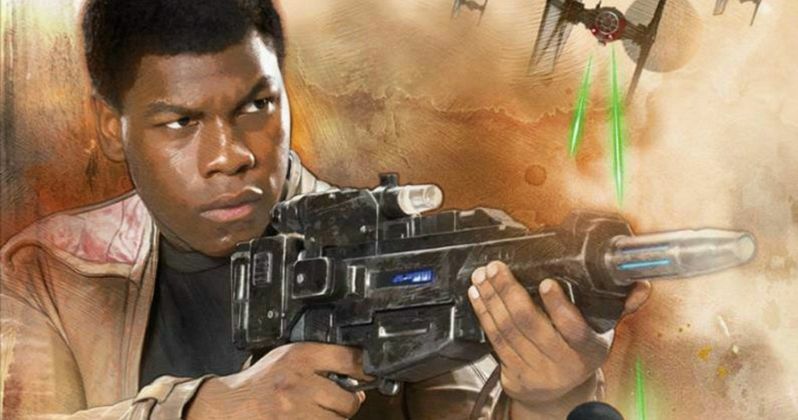 With a new look, Finn is ready for a new mission. Since trading in his Stormtrooper armor for a new set of gear, Finn's outfit might not be flashy, but it's all that a hero needs to succeed." Ok. It's a more detailed account of what we already know from the two trailers and the vast amount of photos and promo art that has been released in the wake of Force Friday. Rey's bio is where it gets really interesting. For a while, it's been debated which of these two characters is the Jedi in the story. Well, even though we've seen Finn wielding a lightsaber, don't count on him being the Master. Also, this description teases that we'll see all of the Knights of Ren, the evil organization that Kylo Ren belongs too. "The mission to take down the First Order is underway! After invading the Starkiller Base, one member of the Resistance has split from her group and found herself in a massive room full of First Order soldiers. Completely surrounded by Stormtroopers with blasters and Knights of Ren with lightsabers, she seems to be totally outnumbered. Unfortunately for her enemies, though, they've made a big mistake: it's not about the strength of the weapon, but the strength of the warrior that wields it." There is speculation that some of the descriptions have been embellished by the retailers selling the merchandise, as they didn't have much to go on. Some of these aspects are said to be hypothetical. And may not represent what we see in the finished film. Though, a huge chunk of the story seems to be revealed here. Including the fact that Rey winds up on the Starkiller Base by herself. And takes on an entire army. Is she the Jedi being awakened by the Force? Sure sounds like it. More about General Hux's Starkiller Base has also been revealed in the wake of the massive merchandise push. It seems this is much more than just a 'base' and it is more powerful than both Death Stars combined. It resides on an as yet unnamed ice planet similar to Hoth. The name Starkiller is a nod to Luke Skywalker's original last name in the first draft of the Star Wars: Episode IV - A New Hope screenplay written by George Lucas. It was later changed, as it sounded too menacing for the hero. Now, the moniker is being used more accordingly. Here is the official description of the Starkiller Base as it appears on the official StarWars.com website. The Death Star was only capable of blowing up a planet. This ice planet base can obliterate an entire community of planets with one push of a button. Though, we don't yet know more about the weapon housed on the base, or how it gets from one star system to the next. The Force Friday update on StarWars.com has also revealed a slew of new characters we haven't yet heard about, starting with a guy named Goss Toowers, who is part of the tireless technical crew that provides mechanical support to the Resistance's fleet of starfighters. Tasu Leech is someone we first learned about when the new LEGO Millennium Falcon images were leaked. Some believed he is the new owner of the fastest ship in the galaxy. This new description says he's leader of the notorious Kanjiklub gang, an intergalactic criminal organization. Other individual characters include the tough and hard-working B-U4D (Buford), who is part of the ground crew that keeps the Resistance starfighters fueled and combat-ready. Ello Asty is a skilled if occasionally reckless X-wing starfighter pilot for the Resistance. PZ-4CO (PEAZY-FOURSEEO) is a constant fixture in Resistance base control rooms, offering tactical data and communications support during important operations. And then there is Sarco Plank. A scavenger and trader who scours frontier worlds for riches, Sarco Plank must wear a specialized mask that keeps his native atmosphere circulating through his alien lungs. The site also has updates for a lot of the troops, armies and gangs we've previously heard about, starting with the Guavian Death Gang Enforcers. The security soldiers of the Guavian Death Gang wear high impact armor that makes them stand out among other deadly criminals. Resistance Troops are made up of soldiers well trained and well equipped, but who must rely on hit-and-run tactics when faced with the overwhelming might of the First Order. Specialized Stormtroopers of the First Order, Flametroopers carry incendiary weapons that can transform any battlefield into an infernal blaze. Armed with specialized weapons, the First Order's Riot Control Stormtroopers are trained to subdue crowds in the most ruthlessly efficient manner possible. And Prisoners of the First Order are compelled to divulge their deepest secrets when subjected to the terrible Interrogator Droid under the command of Kylo Ren. There is also a descriptor for the First Order Snowspeeder, a vehicle that was first introduced in Star Wars: Episode V - The Empire Strikes Back. The First Order deploys these fast, maneuverable gunboats for combat in subzero climates. And Finally there is Unkar's Thugs. The strong-armed bullies who work for junk dealer Unkar Plutt help keep his scavenging business running on the remote, lawless world of Jakku. A few of these characters haven't gotten toys yet, so a second wave of merchandise is expected to hit sometime in late November or early December, just in time for Christmas. What do you think about this new wealth of information?